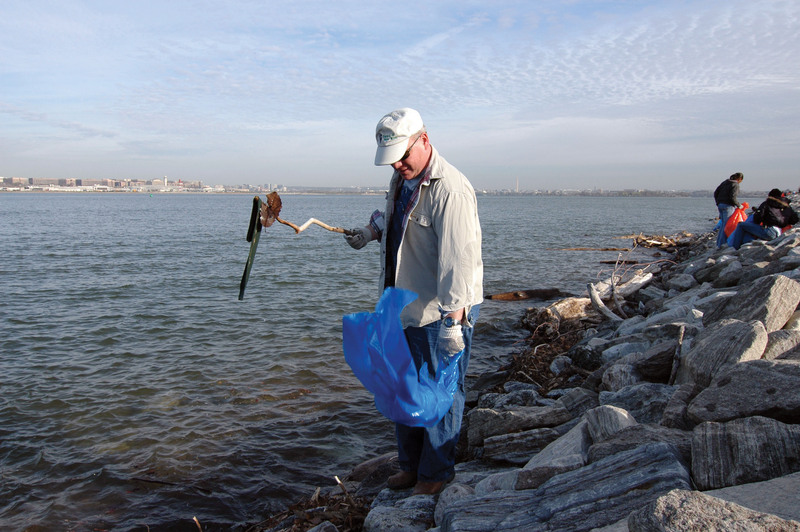 BOLLING AIR FORCE BASE, Washington, D.C. (April 05, 2007) -- More than 100 people from the Bolling Air Force Base and Anacostia Naval Station community gathered here March 31 to tidy up the more than 1.5 miles of Potomac River shoreline that runs along the western edge of base. Second Lt. Collin Polt, with the 11th Wing Civil Engineer Squadron, spearheaded the Bolling effort to remove rubbish from the shore of the river and to make the area look nicer for the many people that use the walking path bordering the water. Chaplain (Capt.) Ken Fisher of the Arlington National Cemetery Chaplaincy, fishes a sock from the Potomac River March 31 as part of a river cleanup effort. Chaplain Fisher was one of 100 volunteers at Bolling, and one of several thousand volunteers in the region surrounding the river, that helped clean trash from the shore. "This effort makes this nicer for the people that live on the waterfront here, but also for the base as a whole," he said. "It's kind of a jogging path, people walk or push their kids in a stroller - it's more of an aesthetic appeal out here. People have come out here to clean up their living area." The cleanup effort at Bolling was but one of many Potomac cleanup efforts organized for the March 31 weekend by the Alice Ferguson Foundation. This year represents 19 years the organization has orchestrated cleanups along the river. According to the group's Web site, cleanup efforts this year involved some 4,082 volunteers at 363 sites, who collectively pulled some 103 tons of trash from the banks of the river. That number includes more than 900 tires, and more than 92,000 recyclable beverage containers. This is the third year Bolling AFB has contributed to that cleanup effort. Lieutenant Polt said that for him, the effort is more than just about appearances along the river, however. "I grew up in Northern Maryland, so I am kind of familiar with the watershed issues, and they've had a lot of pollution problems," he said. "At one point you couldn't even fish in the Potomac. I think the more people that actually come out and see the area, the more people will want to come help clean up." Much of the trash pulled from the river was plastic bottles and foam, said one cleanup participant, Chaplain (Capt.) Ken Fisher of the Arlington National Cemetery Chaplaincy, who also fished a sock from the river using a tree branch. "There's a lot of plastic bottles, a lot of drink bottles - lots of bottles," he said. "If people would just put their bottles in the trash can, the trash receptacle, it would save a lot of work for everybody." The chaplain said taking care of the environment is everybody's responsibility. "I think our environment is one of the most precious things we have to protect," he said. "And it is our responsibility to keep it clean. So I'm doing my part." Lindsey Lette, a childcare provider on base, was also out participating in the river cleanup. She said she uses the path along the river daily to walk her dogs, to walk with her husband Staff Sgt. Nathanial Lette, or to take her children out. "When you see the stuff out here when you walk at night, you can't really do anything about it," she said. "So an opportunity to clean up where you live is awesome." Chief Petty Officer Cheryl Barton works at the Chief of Navy Chaplains office at the Navy Annex in Arlington, Va. While not assigned to Bolling Air Force Base, she said she used to run her physical training test along the river, and felt compelled to participate in the cleanup effort when she heard about it. She also says she knows first hand the effects of trash floating in the river. "I'm pulling so much plastic out of the water," she said. "My dad lost an engine on a boat because of plastic and he'd be proud to see me out here now pulling this out of the water."